Several years ago on the blog I mentioned that I pray for my future husband (and frequently write him notes, cards, and prayers) on a daily basis. I shared 10 Things to Pray for your (future) Husband in a post on the blog which you can find HERE. For the first couple of years of writing on this blog and I didn't write as much about singleness as I thought I would. There were a couple of different reasons for this but if I am completely honest it was because it is such a tender subject to my little heart. I think that there was a small part of me that didn't want to hear criticism from those whom I didn't know as I explored this very vulnerable subject. But, as I kept praying about this and my blog, I felt the Lord's gentle nudging to start to write more about this topic. I kept interacting with more and more singles who were struggling and I wanted to encourage them in this difficult season of waiting and life. Last year, with the release of my new book, "Prayers for the Single Journey -for women" I made the decision to start sharing more of my heart for single gals on Monday's on my blog. As an "older" single lady my prayer is that I can offer some encouragement in this season for the difficult days and rejoice with y'all as we see the Lord work in different ways in our lives. (If you are looking for all of the posts on singleness that I have written you can find them all HERE.) I also hope and pray that we can encourage each other, no matter the waiting season that we each are in. One- I pray that I bring my future husband "good, not harm, all the days of my life". (Proverbs 31:12) One of the ways that I can do this is to recognize that my husband (no matter how special and wonderful he may be) will never be able to fulfill or be "everything". Only the Lord can do that. Two- I pray that I will release any and all expectations of what I hope my marriage will look like, and pray that the Lord will give me a vision for marriage that is based on His word alone. Four- I pray that the Lord will take away all of my selfish nature and replace with the fruits of the spirit which include, "love, joy, peace, forbearance, kindness, goodness, faithfulness, gentleness, and self-control" (Galatians 5:22-23) Along with this, I specifically pray that I would always have life-giving and redeeming words that I would speak to my husband. Seven- I pray that I will live a life of forgiveness and repentance "so that my sins are wiped out, and that times of refreshing may come from the Lord" (Acts 3:19). The last thing that I want to do is to be a bitter and unforgiving wife. Eight- I pray that my heart would be sensitive to the things of the Lord and that my talk would reflect my heart. (Proverbs 4:23 and Psalm 34:12-13) I pray that I would know my purpose clearly and where the Lord is calling me. (Psalm 20:4) I pray that even now the Lord would bless my future marriage with clear direction (Amos 3:3) and that the Lord would "perfectly join together in the same mind and same judgment" (I Corinthians 1:10) my husband and I so that we are completely united in the Lord. Ten- I pray that I will develop into a virtuous and capable wife (Proverbs 31:10). Are there any specific prayers that you pray for your (future) or current spouse? I would love to know! Happy Monday sweet friends! Those are all great ideas for prayer. I think praying over our relationships is so important since they are the closet connections we have on earth. Thank you so much for your comment! I TOTALLY agree with you that praying over our relationships is so important!! This is definitely an area that I am working on!! Thank you for taking the time to leave such a sweet comment! I hope that you have a wonderful Monday and a wonderful week! I prayed for my future husband for a long time, especially when I was going through health issues (albeit nothing near as much as you are going through--prayers! ), and God granted me all my prayers. He always provides! I will pray for you and you future husband, as well! Thank you so much for stopping by and for your sweet and encouraging comment. I must have read this about 20 times already as it was so delightfully sweet and encouraging! Thank you so much for taking the time to stop by and encourage my little heart in this single journey and for ALL of your prayers!! You truly have blessed me! So excited to connect with you more and get to know you more! These are really great. 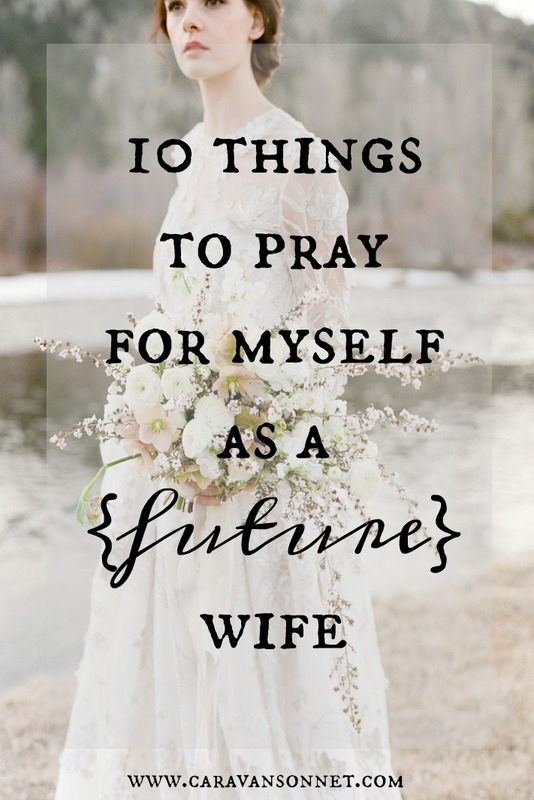 I've been working through Praying For Your Future Husband by Robin Jones Gunn & Tricia Goyer but I hadn't really thought much about praying for myself as a future wife. Thank you for sharing. Oh my goodness Kimberley! I LOVE Robin Jones Gunn!!! :) And that book is wonderful!! (And I love the name of your blog- was it inspired by the Christy Miller Series?? :)) Thank you for stopping by! I would love to connect with you more!! p.s. I would love to have emailed you directly back but unfortunately you are a "no reply blogger". I hope to connect more with you in the future! Thank you so much for stopping by and leaving such a sweet comment! Congrats on our "newlyish wedding"!! I am so glad that you think these are relevant! I would love to know of any other prayers you would suggest!! Thank you again for stopping by and encouraging my little heart! I can't wait to connect more! Chelsea, Thank you so much for your comment! CONGRATULATIONS on your recent marriage!! I totally agree with you that being intentional with prayer is something that takes a lot of effort. And discipline. It is definitely something that I am working on in my life!! Thank you so much for stopping by and for sharing such a kind and encouraging comment!